Our Mech Paladin deck list guide features the best Rise of Shadows deck list for Season 61 of Hearthstone (April 2019). Our Mech Paladin guide also contains Mulligan advice, card combos and strategy tips. Mech Paladin is a Hearthstone deck that came into prominence with the launch of the Boomday Project. With all the new mechanical minions added to the game, the aim was to fully exploit the way they worked together with the Magnetic keyword to create a large and sticky board that opponents would have great difficulty taking down. The deck follows that same principle following the release of the Rise of Shadows expansion. However, the Paladin class has got a number of new Secrets that can help you get even more value out of the existing Mech package, so we’re seeing the deck make a return to the upper tiers of ranked play. In this latest version of our guide, we've got detailed strategy advice on how to pilot the deck when you’re facing both slow and aggressive opponents in the new meta. We've also highlighted a few tips on how to navigate the Mulligan process and broken down all the core combos so you can get the most out of this deck. This is the version of Mech Paladin that’s been climbing in popularity over the last few days of the Rise of Shadows meta. Should it see any more refinement we’ll be sure to continue updating this list. Mech Paladin is a mid-range deck that builds a strong board presence through the interplay of Mechs and Secrets, and then buffs those minions even further to overload opponents. The deck also makes full use of the Magnetic keyword to empower its minions even further or trigger Deathrattle effects ahead of schedule to make devastating tempo plays. The Legendary Paladin spell from The Boomsday Project expansion - Kangor’s Endless Army - still plays a large part of Mech Paladin as it allows you to bring back three friendly Mech minions with all the Magnetic upgrades that were applied to them. It means that even after your opponent has dealt with threats such as Annoy-o-Module, Mechano Egg and Zilliax, you can just as quickly resurrect them all over again. Early game: You’ll be looking to set up your Secrets in the early game. As tempting as it can be to just lob them all on the board at once, do try to be a little more strategic about it than that. For example, Never Surrender! and Redemption are much better plays when you have a board established. Others you can play more freely to try and psyche out your opponent. You can look to set up a board with Sunreaver Spy and Bellringer Sentry to begin with too. Mid game: Continue to develop your board and trade into your opponent’s minions in the mid game. You have an excellent way to slow them down too using Annoy-o-Module. On the other hand, if you’ve fallen behind, Consecrate is on hand to help with a full board clear. You’ll also want to look at setting up a Mechano-Egg and buffing it with some of your Magnetic minions so it can be activated later in the game. Combine it with Wargear, for example, and you’ll have a whopping 5/10 creature for your opponent to fight off. Late game: With a strong board established you can really go into overdrive in the late game with some powerful legendary cards. Zilliax is great for applying some immediate pressure to your opponent thanks to the Rush keyword, while the Lifesteal and Divine Shield abilities will give you both some extra survivability. Other late game options include Mechanical Whelp, which you can combine with other Mechs to make stronger and then trigger the Deathrattle effect. Of course, there’s the old faithful Tirion Fordring too. Lastly, you have Kangor’s Endless Army to bring back up to three of your destroyed Mech minions. Your opponent may think they’re safe after clearing them earlier in the game, but if they’re out of removal they’ll have no answer to such a big swing turn. 1. You’ll want to take more of a control approach in the early game, but with the sticky and high Health minions you have this shouldn’t be too much of a problem. 2. You have some solid early game Taunt options in Annoy-o-Module that will shut down aggro. 3. The deck also runs a copy of Mysterious Blade, which is an excellent weapon to clear away enemy creatures. 4. Without Equality this deck doesn’t have the greatest board clear potential but Consecrate should at least help you along the way. 5. Once you starve them of resources your more powerful late game will allow you to take full control of the match. 1. As an opposite approach to aggro, you’ll want to take the aggressive line in this matchup and try to push for damage quickly. 2. Although it helps to develop a wide board, try not to overcommit and run into a board clear that may set you back too far. Always keep more resources in reserve. 3. Be careful not to invest too many buffs into a single minion either. A well-timed hard removal or a silence effect can completely ruin your plans. 4. Prismatic Lens can be used brilliantly to get ahead of control decks if you get lucky and hit an expensive minion with the Mana cost swap. 5. Kangor’s Endless Army can be the spell that gives you the last bit of reach you need in the late game to secure the win, so make sure you don’t fill the resurrection pool with too many weak Mech minions. 1. Sunreaver Spy: Strong two-drop but if you’re running a Secret it becomes even more valuable in the early game with the stat buff. 2. Mysterious Blade: Similar to the previous card, if you have a Secret down before this is played you can clear off more minions thanks to the Attack buff. 3. Hidden Wisdom: If the deck lacks anything it’s card draw, so holding onto this can give you some extra security. 4. Autodefense Matrix: Allows you to keep one of your early game drops alive if your opponent tries to clear it. 5. Commander Rhyssa: An excellent minion that ensures you get some extra value out of your Secrets. Here's an overview of the card combos that are available in this deck. The exact make-up of Mech Paladin will change over time, and we'll always make sure this section is updated to reflect those changes. - The following cards in this deck possess the Magnetic keyword, which means they can be fused with an existing Mech if you drop them to the left of the target: Annoy-o-Module, Wargear and Zilliax. All stats and abilities are combined as part of this process. - There are many ways in the deck to make the most out of your Secret cards, so look to combine them with Mysterious Blade and Sunreaver Spy in order to buff those two cards. - With all the low cost Spells in this deck you may get very fortunate with Prismatic Lens and be able to play one of your late game minions much earlier thanks to the Mana swap. - When a Secret is triggered while Commander Rhyssa is on the board, its effect will occur twice. Use this to resurrect two copies of a minion through Redemption or give your whole board a tasty Health buff with Never Surrender! 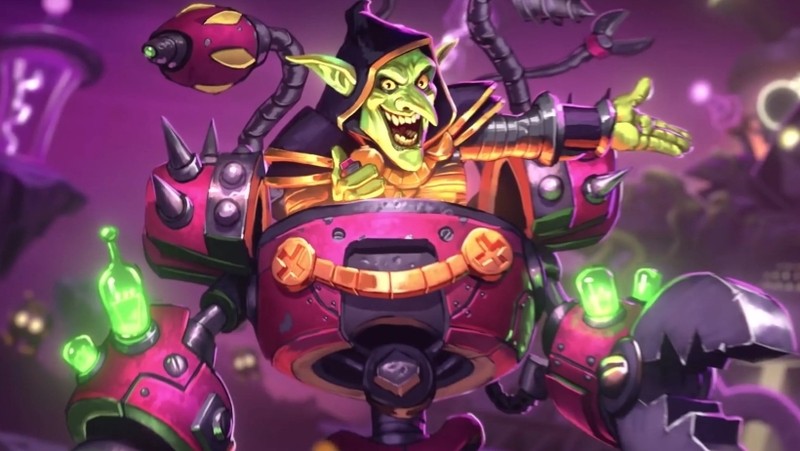 - Mechano-Egg and Mechanical Whelp are both cards you want to kill off as soon as possible to get to their hugely beneficial Deathrattle effects. Here’s where the Magnetic keyword can come in handy, while Secrets that also bring them back to life ensure you get even more value from them! - Kangor's Endless Army is the Paladin's new Legendary Spell. Not only does it resurrect three friendly Mechs, if any of those Mechs had been upgraded via Magnetic then they'll retain those special upgrades. You might want to keep track of your Magnetic plays over time to ensure you get the most value out of this spell. Sunreaver Spy: A solid two-drop that becomes even more of a threat if you’re running a Secret at the time. Mysterious Blade: Another card that’s hugely empowered by your Secrets and then becomes a terrific way to remove almost all early game drops from your opponent. Commander Rhyssa: Offers a way for you to get even more value out of your Secret effects, just be sure you can keep her alive for the turn they might be activated on. Annoy-o-Module: A bulkier Annoy-o-Tron that’s a right nuisance for aggro decks to deal with effectively. Bellringer Sentry: Sets up a light but useful tempo play by bringing your Secrets onto the board with spending turns or Mana to play them. Prismatic Lens: A bit of a risky play but the payoff can be huge if you manage to swap the cost of one of your late game minions with a cheap spell or Secret. Mechano-Egg: Will happily gestate on the board until you’re ready to buff it with a Magnetic minion and then it becomes a serious threat. Even more so when it hatches too, thanks to the 8/8 Robosaur waiting inside! Wargear: Works well enough as a five Mana 5/5 minion, but it truly shines when used for its Magnetic keyword to buff another creature. It’s like a more versatile Blessing of Kings! Zilliax: A powerful new Mech minion that can be used as a comeback mechanic thanks to the Lifesteal and Rush keywords. It’ll likely stick around on the board too thanks to its Divine Shield. Even more useful when buffed with Magnetic creatures. Mechanical Whelp: Triggering the Deathrattle gets you a huge minion onto the board and you can make use of this effect multiple times through Redemption if timed well. Kangor’s Endless Army: This Legendary spell has inspired players to seriously try Mech Paladin. The potential value in the late game to create a huge tempo play is undeniable, but it does require a bit of luck and forethought to resurrect useful minions. Tirion Fordring: This classic Paladin card just isn’t going anywhere and it just shows how strong it can be in practically any deck type.